Guys, if I’ve ever needed to move to a bigger place to store this motherload of a wood haul, that would be yesterday. Welcome to my front driveway! Don’t mind the kiddie pool… it’s there for a splash of colour for the photos. One of my neighbours came by, giving me a heads up of a fence having just been taken down. I didn’t waste any time. I head on over there to see what was what. I liked what I saw! So, I brought it home. ALL OF IT. Just don’t ask how much my strong, wood luggin’ son appreciates a junker mom right about now. And please don’t ask me where I’m putting it. Or what I’m doing with it. Because my answer would be as blank as a white plank. I justify this one as ‘stock’. You can’t just BUY this. You have to FIND it. It’s like a free, outdoor Costco. I don’t call it the $300 Store for nothing. 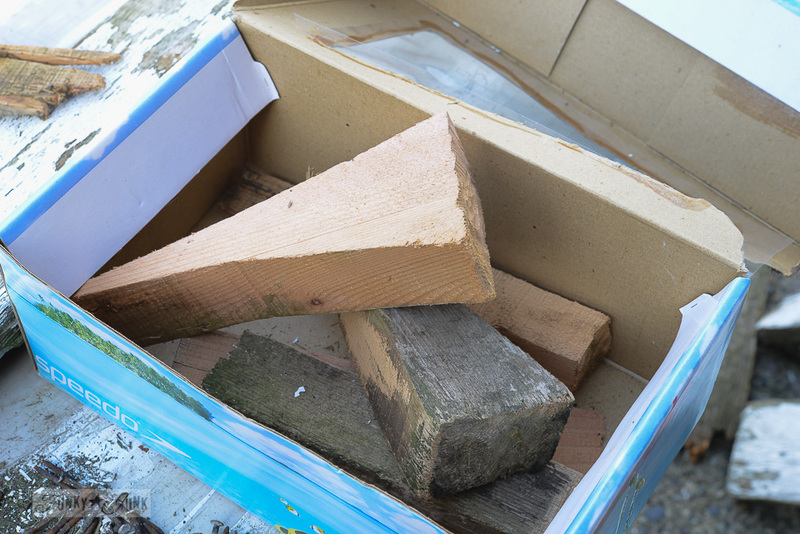 Anyway, when I was junk pinkin’ from a farm about a week ago, the farmer handed me this box of wooden wedges, and proceeded to show me how he took pallets apart with them. My mouth dried out as my jaw hung open. It was that easy. So he handed me a free starter kit of wood wedges he made himself. They are the secret ingredient. And… it changed my life. 1. 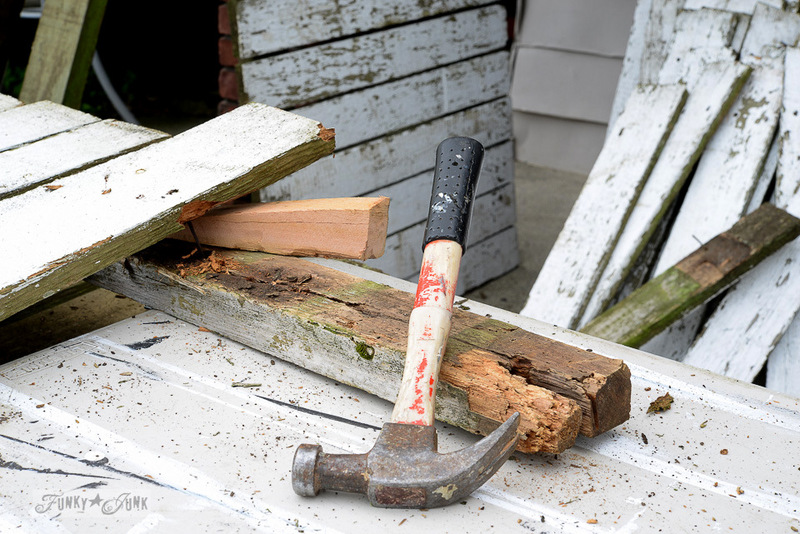 Tap a wood wedge in between a plank and support, with a hammer. The wedge provides a surface to pound, so you don’t ruin the (rotten?) wood planks. And these planks were flying off with little effort. 4. Flip the board over, and bang out the nails as far as you can. 5. Flip the board right side up, and pull the nails out of the boards. 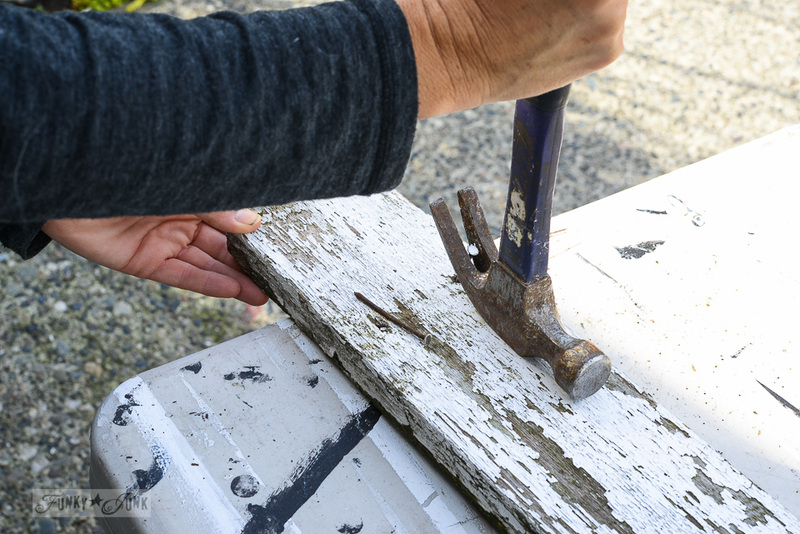 Always, always remove nails from boards as soon as you can. Never store them with nails. They are like weapons if you do! Just ask my son’s foot. Tip: I worked on these wet, and they came apart like butter. The next day they dried, and were tougher to work with. So.. if you find WET planks, all the better! 6. Lightly pressure wash each side to clean them up. I haven’t pressure washed these yet, but I will. HERE is how I pressure washed other fence boards. Unbelievable outcome! I will be going over them with a light touch, so the white paint stays intact as much as possible. You could also scrub them down with a stiff brush and soapy water, or diluted bleach to remove the mildew. But it’s a LOT more work. 7. Lean them to completely dry before storing. 8. Wonder where in blazes you’re gonna put it all. 9. But never worry about what you’re gonna do with it all. 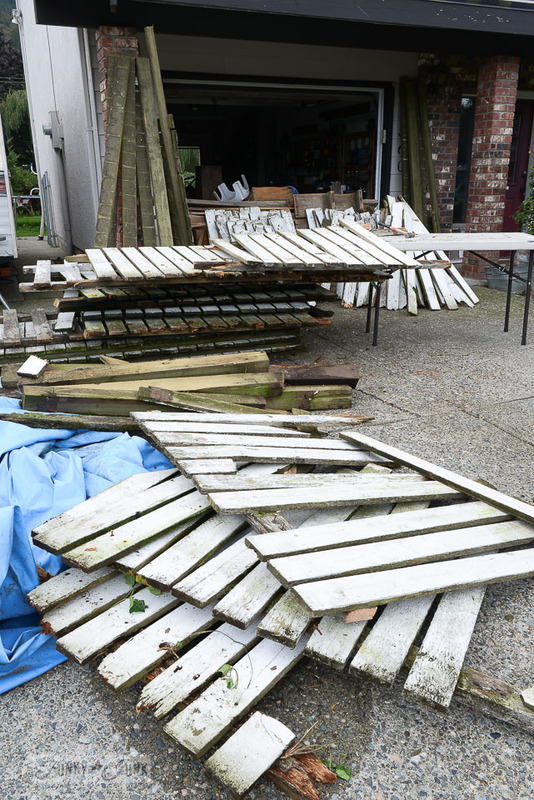 And just for fun, here’s the last fence haul I brought home. What would you make with this amazingness?! And feel free to share any tips you may have! I am forever grateful for this hack. Separating pallets has been the bane of my existence. You’re the best for sharing! Wow! Gotta try that! I have several pallets that need to be taken apart. Drooling! That is one fantastic haul! And thanks for the tip about the wood wedge, we’ve definitely gotta try it! 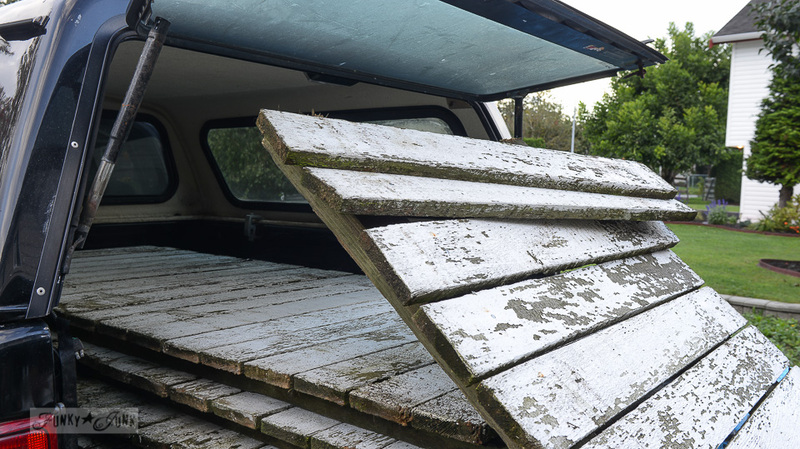 I can’t wait to see what gorgeousness you make with these perfectly rustic boards! Oh my goodness! White chippy, my favorite!!!! Yay! I know you will come up with some amazing projects! Thank you for sharing the farmers tip for taking those apart. I can’t wait to try it out! LOTS of wood! Have fun being creative–for a long, long time it looks! 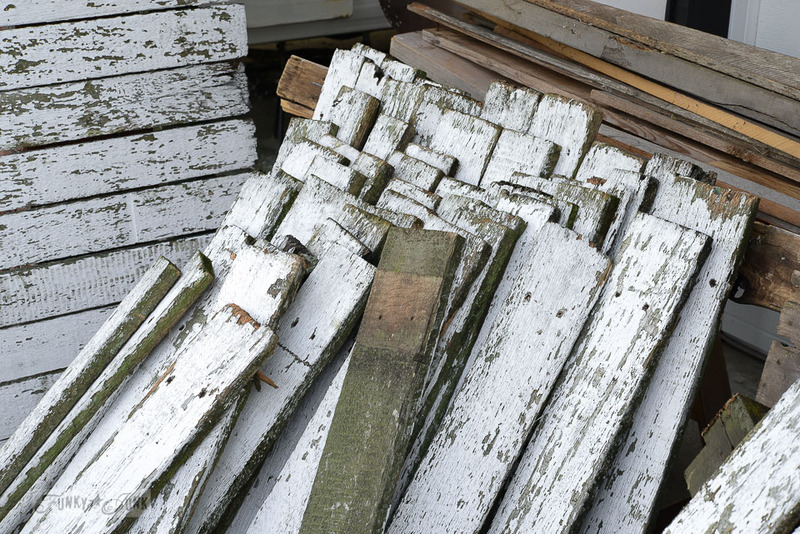 Wow, you could start your own salvage yard with all that fabulous weathered wood! I see signs, lots of signs. Never, ever pass up a load of old wood, you just never know when you’re going to need it!! Thanks for the removal tips, Donna. Great post! 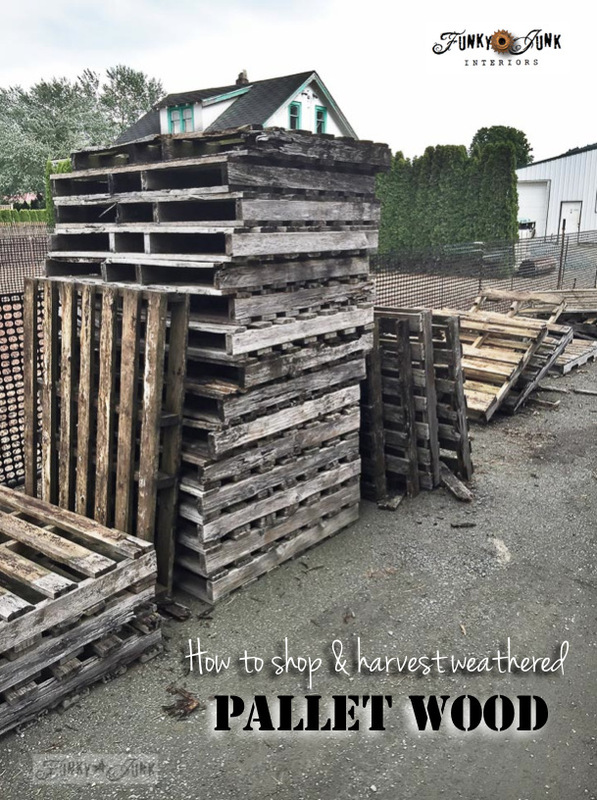 I have been reluctant to “get into” pallet wood…but these steps make it seem less daunting!! Can’t wait to see what projects you dream up! Oh, that explains it! All the ones I tried had screw nails and neither a wooden wedge or a steel wedge would work. If you use some WD40 or liquid detergent on the nail. then use a shallow wedge followed by a larger wedge the spiral nails will release a bit better. Shallow metal wedges are lifesavers for pallets. One other trick for those who live in really cold country, is to leave them out in hard freezes and snap the nails. Of course this means you are working outside in really cold temps too. SUPER great tip, Kel, thank you! Will try next time! Thanks for the how-to! Anything that makes a project easier is always welcome! This is a stroke of genius. I hope this works on our pallets. In Oz, most of our pallets are from overseas via sea (Malaysia, Indo + SriLanka) so they not only have screw-nails but they’re also treated (sprayed) for our strict quarantine laws and this also makes the wood swell slightly (around those pesky screw-nails!). I am going to give this tip a good workout tomorrow. I feel so much better about my junk filled yard…your driveway made me smile! I agree with everyone that they’ll be ideal for signs. I would also keep a section for a photo backdrop. 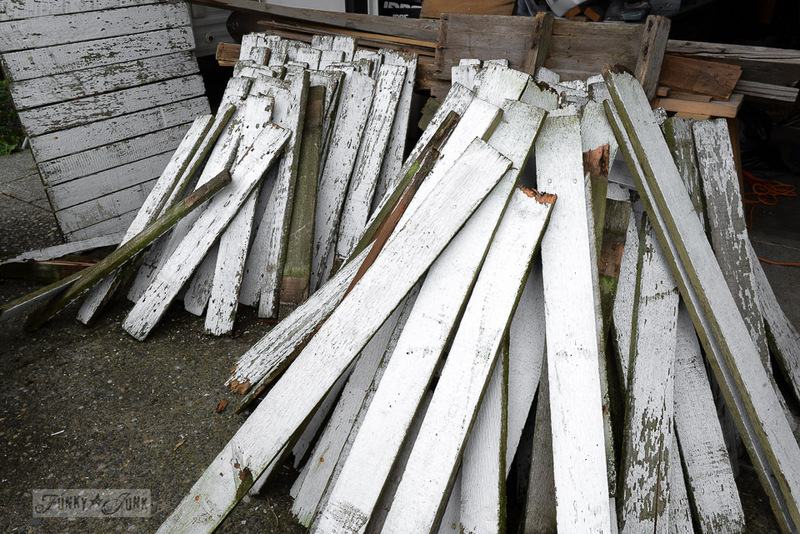 Such a fantastic score…these drool-worthy white-chippy-weathered planks couldn’t have come to a better home…I can’t wait to see what you choose to do with them! 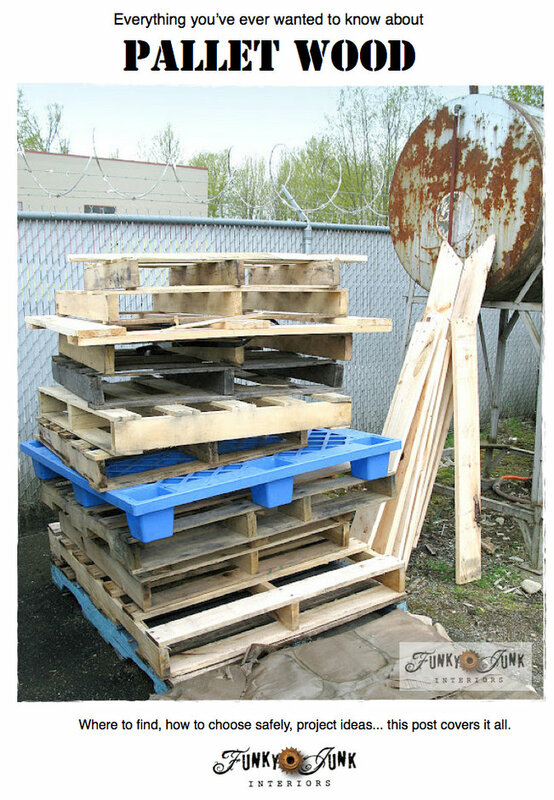 Well, I think is about time to give those pesky pallets a try! 🙂 Thanks for the tips. What a great haul you got. I can see lots of signs and hey even furniture out of them! I love this idea, i have a metal wedge for splitting firewood gonna try that. But the white fence boards you have , reminding me of an outdoor christmas tree yard decoration I saw at a craft show one time! Oh the ideas!! haha, I love that, “I’ll pay you less if you complain.” So using that with my kiddos. It would be a shame to leave all that wood. I’m sure you’ll find something amazing to do with it. Great tip using the wedge and mallet, I’ll have to try that out on my next pallet. Oh hoarder of Spectacular Crap, thank you for that wonderful tip!! 1. 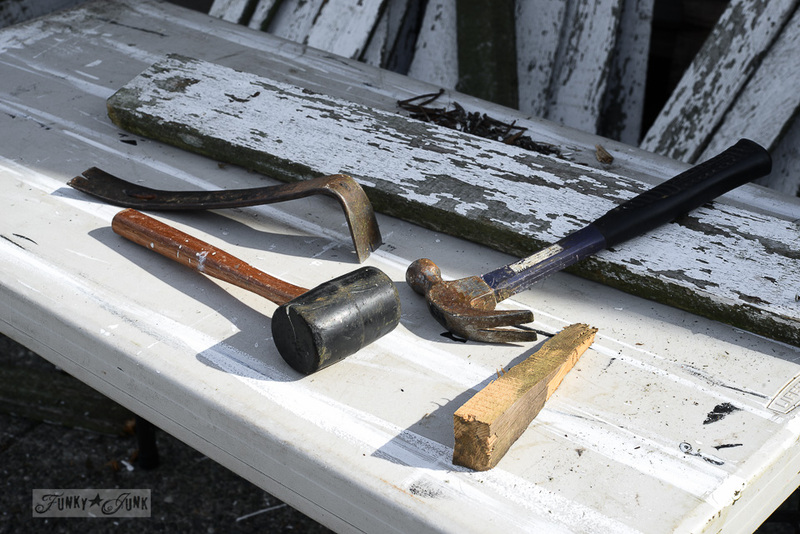 When de-nailing, engage the nail with the hammer claw, and then slip a scrap piece of wood (like a broken piece of pallet) at right angles to the pallet wood you’re de-nailing and under the centre of the hammer (i.e., directly under the handle, mid-way between the face and the claw). 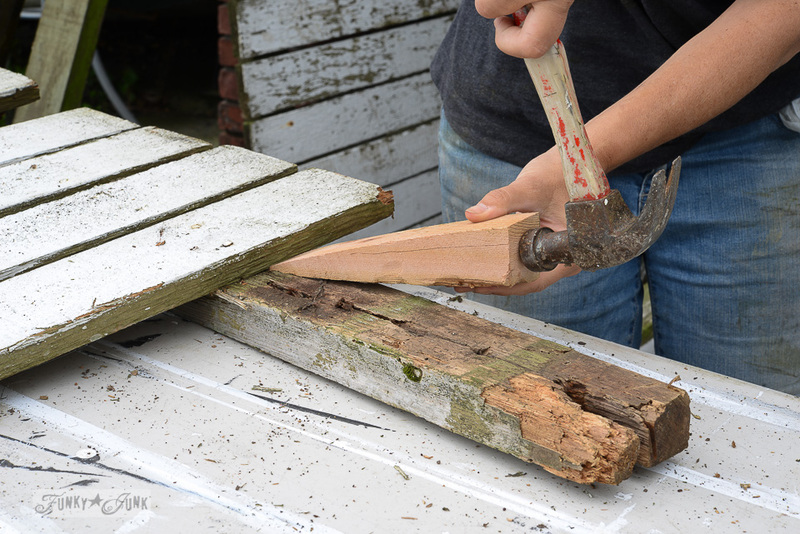 For nail heads close to the pallet wood use a piece about half to one inch thick. It increases the leverage and requires less strength to remove the nail. Using thicker blocks of wood in this way is also useful for nail heads that have been hammered a long way out (but are still firmly fixed). 2. A piece of metal pipe twice as long as your hammer handle and the inside diameter of which is just bigger than the handle’s diameter, will increase the leverage, too. Slip the pipe over the handle. 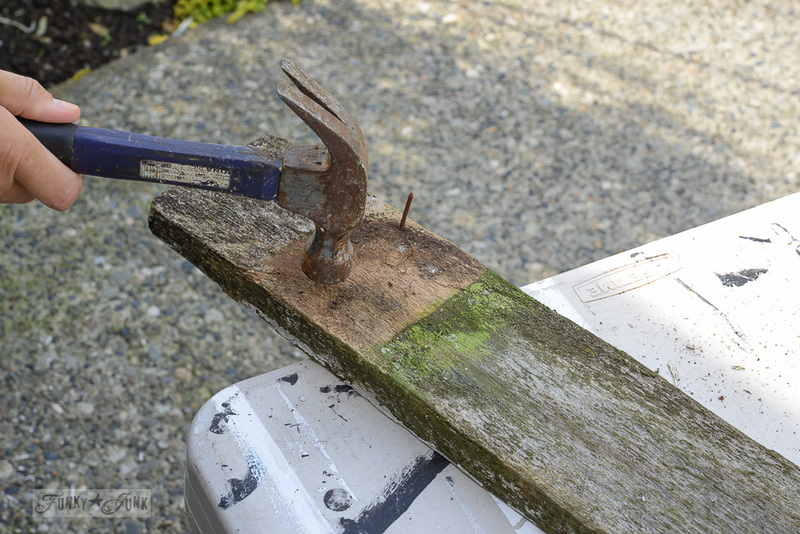 This effectively turns your hammer into a pry bar and I have used long (6 foot) pipes to get some big nails out of sleepers (combined with method 1), not that I recommend this for pallets. A short pipe will just make the job easier, especially on twister nails. Note, both methods (especially when used together!) generate a lot of force, so beware flying nails and wear appropriate safety equipment – glasses especially. Also, the last method is going to put a lot of stress on your hammer handle. Make sure it’s up to it before you begin! Thank you so much for chiming in Steve! I didn’t know your tips, but you can be sure I’m going to try them out! Fabulous! I’m going to try this tomorrow. I’ve been pulling my hair out trying to get slats off a fence without destroying the wood. We rent. Our fence is 8′ cedar. It butts right up to the neighbor’s 8′ chain link fence. Unknown to us, 3 years of weeds had grown 5 feet high between the fences. It’s infested with fleas. I need to take our fence apart to get all the weeds ripped out, lay down diatomaceous earth, then plastic and gravel so the fleas die and the weeds don’t come back. Then I have to replace the slats. The wood is dried out, untreated or treated years and years ago. My landlady should be doing this, but she’s hopeless and it’s got to be done (Oh & the nails are 3″ & embedded deeply). So tomorrow I start with your idea. Everyone cross your fingers. I’m desperate. Hi, you said you used those wedges for dismantling pallets. Then you demonstrated on soft fence wood. That would not work well,if at all, on machine nailed pallets……regards…Shaen. Hi Shaen, the farmer that showed me this tip demonstrated it on a well made pallet. It takes more pounding, but it did work. I tried it right after him. Pallets with a little more weathering are indeed easier to work with. I too love reusing and working with wood. I enjoy seeing and reading what you are doing. keep up the good work. This is the best tip I’ve seen in a long time. Kudos to the farmer for sharing. Hi Michele, I’m unsure what the wood wedges were made from, but they certainly were not anything fancy! They do get beat up after time, but you get lots out of them before that happens. Hope you try it out! Hey! 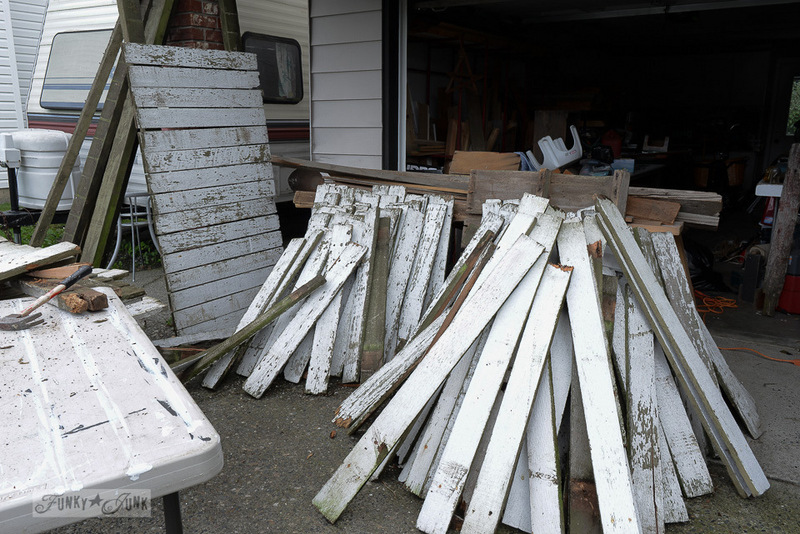 I did them same thing…came across a whole old white chippy fence in the trash and brought as much home as my family could tolerate. I didn’t know what I would do with it, but things keep coming to me. So glad I picked it up because when I don’t bring junk home I just have so many creative ideas later of what I would have done with it. Making usable stuff from junk is so much fun. Thanks for this helpful post on the pallets. All of your ideas are great ideas!! 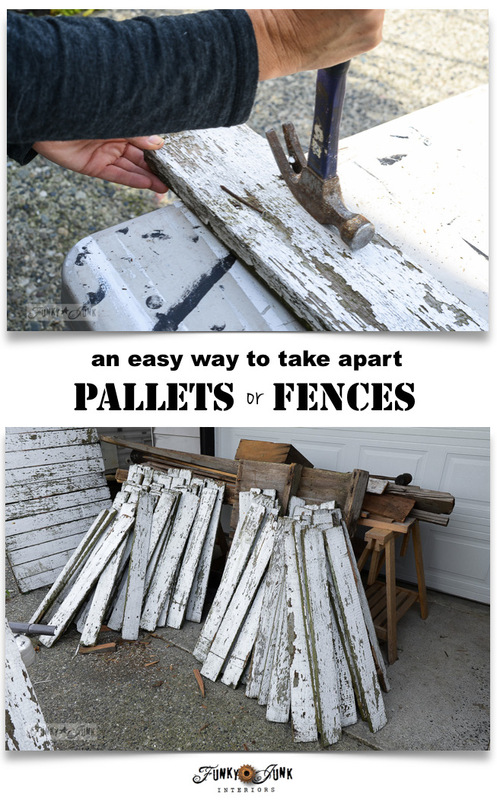 I have tried many ways to get oak pallets apart which is different than a fence…a lot different. Wish I could find an old fence, it would make things a lot easier. You certainly have a nice “stash” there for many creations. Have fun. Barb, you bet it is. This method doesn’t work for all pallets I find, but the majority of them that are weathered, not an issue. Hoping this method may come to mind if you land stuff where it may work! It’s such an easy fix. Wow, an amazing find of free wood! Thanks for the tip on using the wedge to take apart the pallet/fence. Great idea and thanks for sharing! I love your candle holders, only you don’t show how to remove the chunks of wood in the pallet, please do so. Can you please send me a picture or link to the project you are referring to? I didn’t write about candles in this particular post so I am unsure which project you’re referring to. Thanks!